This is an event poster from UFC 23 which took place in japan. 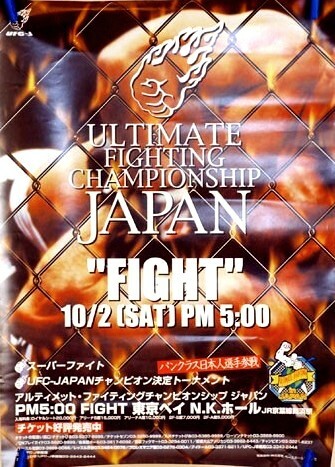 This was also sometimes referred to as UFC-J 2 or Ultimate Japan 2. this event took place on November 19, 1999 at Tokyo Bay NK Hall in Tokyo, Japan. The title fight that night was Kevin Randleman vs. Pete Williams for the vacant heavyweight title spot(Bas Rutten had retired after UFC 20 and winning that title). Kevin Randleman went on to win the heavyweight title. The event also featured a four man “Japanese” tournament, held to crown the first ever UFC Japan Champion. The tournament was the first in the UFC since UFC 17, and the last ever tournament held by the UFC. Kenichi Yamamoto went on to be the first japanese UFC champion holding the middleweight title. SEG originally intended UFC Japan to be a separate company, run by local promoters, but financial problems shut that idea down after ufc 25. UFC 23 was also the first show the UFC held where a vhs video was not released. This entry was posted in UFC Japan, UFC posters. Bookmark the permalink.